All over the Sudbury area, shared laundry facilities are seeing dozens of loads of laundry being done all day, every day. In strata or co-op properties, a functioning laundry area is one of the most searched-for amenities out there. For property owners or managers, keeping these spaces working can mean all the difference between happy tenants and a whole lot of headache. Far from heavy duty, mechanical repair, a Sudbury dryer vent cleaning can keep your machines running better, for longer. Laundry facilities are an often overlooked aspect of properties – particularly in multi-unit living spaces. These shared spaces are used for an hour here or there throughout the week and not given much thought after that. The longer that these spaces are ignored, the more problems develop from clogged ventilation systems. Try as they might, lint traps are not enough to completely block debris from entering sensitive areas. Each load of laundry adds to the buildup forming inside pipes and vents, limiting airflow. Small deposits of debris will begin silently but as they collect more and more material, they become hard to ignore. As these deposits begin to layer over one another, they trap allergens, dust and moisture. This moisture is also known to lead to mould growth over time. Without proper maintenance, your ventilation system could be forming its own little eco-system without you ever knowing! Improper airflow leads to ineffective appliances. Making your vent cleaning services routine, eliminated unnecessary wear and tear on appliances, reducing the risk of repair and replacement. Every ventilation system has both visible and unseen areas. Focusing on one of these areas alone will do little to clear away those more difficult clogs that you giving you grief. 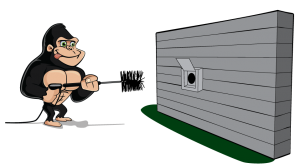 When you choose a professional service for your multi-unit Sudbury dryer cleaning, you are getting the Gorilla guarantee of a clean and passable system.